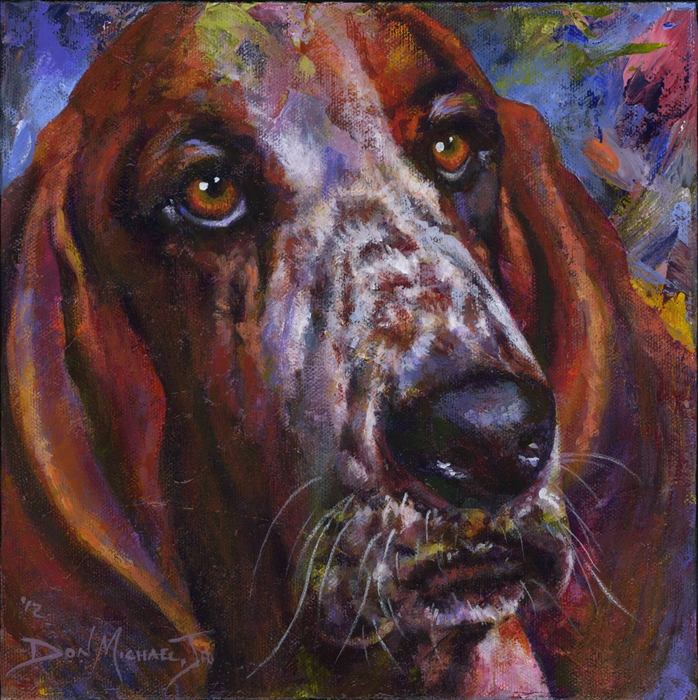 When my good friend and fellow artist, Kathleen Krucoff, saw that I was starting to work animals into my Over the Under-Schmeering (OTUS) series she asked if I would be interested in trying a basset hound. Now, Kathleen did not have just ANY basset hound in mind. Nope. She specifically wanted me to do a portrait of her newest family member, Quorra. So, once again, I found myself wandering outside of my comfort zone. It’s one thing to paint an animal generically. It’s a totally different thing to paint one specifically – especially if you have never met the animal in person. This afternoon I received an excited phone call from Kathleen. Quorra’s portrait had finally arrived in the mail. The whole family got so into the fun of unpacking the new portrait that Dan had to take some photos of all the excitement. 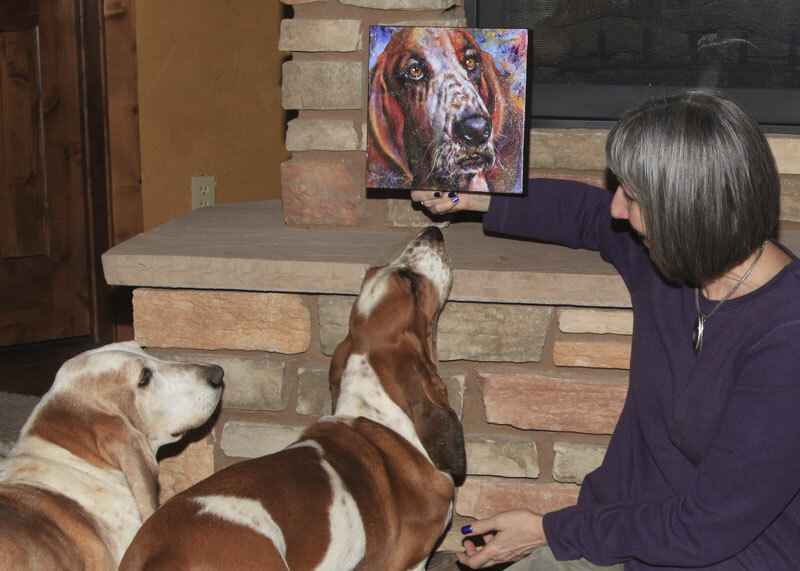 Below, Quorra and her older sister, Nocturne, are jumping up and down (well, as much as bassets jump up and down) for joy as Kathleen displays her new purchase. Great post and GREAT work. I love this portrait of Quorra. I’m so glad you accepted my request to do this commission. And I am tickled that you incorporated touches of my favorite color, purple, in Quorra’s portrait. I think everyone can see what a fantastic job you did in capturing Quorra’s spirit. In all my excitement, I forgot to tell you that you did capture her beautiful soul that shines through her eyes too. Thank you my friend. I so enjoy watching your artistic journey and thoroughly enjoyed our conversation about art last night. Wow, awesome painting… I simply love it…! You absolutely nailed her beautiful eyes! What a stunning portrait of a gorgeous dog. I absolutely LOVE! this new series of yours. WOW!!! I can see why Kathleen is so pleased. Kathleen… Thank you! I’m so glad that you like Quorra’s portrait. It really makes me feel quite proud. Our conversation last night was the highlight of my day. It’s always a joy to connect with fellow creators. 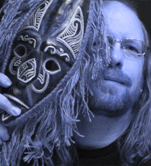 PAMO… Thank you, so much! It’s amazing to me how well this new series has been received. It all started out as a simple experiment. It’s a beautiful painting, so glad to see fellow bloggers supporting each other. A woman I recently befriended locally also does pet portraits and she and I are planning on bartering. I do love seeing the way you combine the OTUS technique with realism. I love your animal series and this is a great addition. I think you will be receiving more commissions for pet portraits based on how great this one turned out! This is really wonderful. I know Kathleen is happy–I saw this on her blog. Nicki… Thanks. I never thought I’d be commissioned to paint someone’s pet. 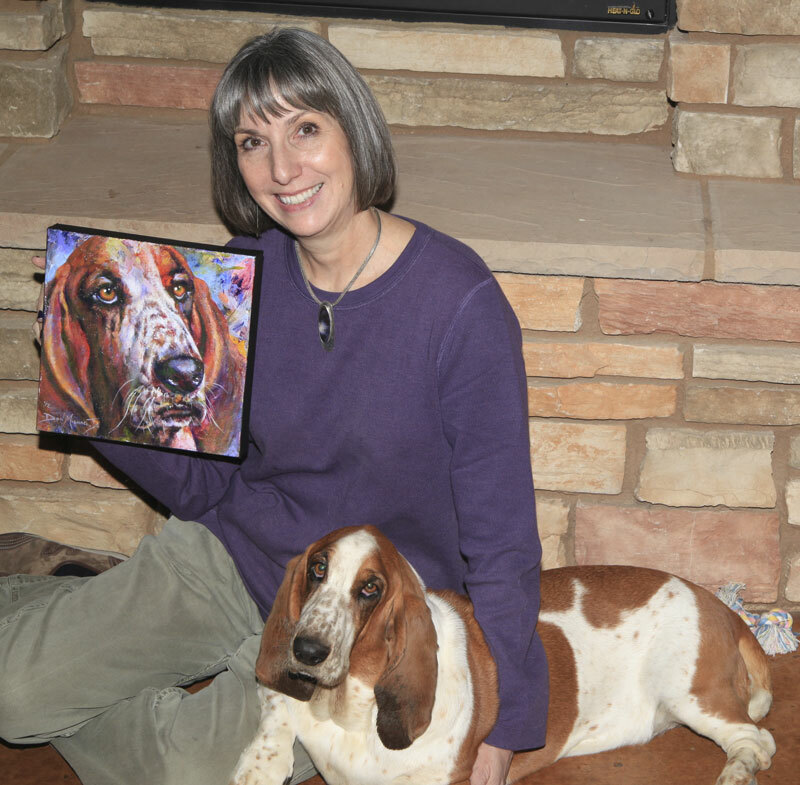 I’m glad that my first was one of Kathleen’s bassets. I’ve followed her family for nearly 4 years now. Hallie… Thank you! I really enjoyed talking with Kathleen upon “Quorra’s” arrival. It was a pleasure hearing the joy.